SAN FRANCISCO--(BUSINESS WIRE)--Jul. 28, 2015-- Visa Inc. (NYSE:V) today announced it is working with Orbitz for Business, the corporate travel brand of Orbitz Worldwide (NYSE:OWW), to provide corporate clients with a turn-key, end-to-end travel and expense solution designed to make booking, reconciliation and reporting more efficient. The solution, Visa Travel Manager, is specifically designed to give mid-market companies control of, and visibility into, employee travel spending. It is planned to be available to Visa issuers and their clients starting October 2015. 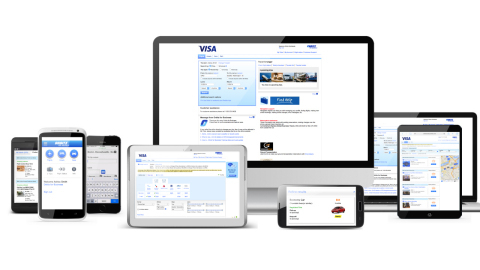 Visa Travel Manager combines an Orbitz-powered booking and payment portal on the front end with Visa IntelliLink reporting and expense management on the back end. This integration gives companies a greater ability to capture total travel spend and have increased visibility across their organization, promote compliance, and provide data intelligence to drive cost savings. Because the system is easy to use, employees can save time and resources by having an easy way to book travel and submit their expense reports. To book, employees will be instructed to use Visa’s Orbitz for Business portal and pay with their Visa business travel card. They’ll receive access to all supplier published rates as well as discounted Orbitz for Business rates, while also being able to use the same platform to manage and submit their expense reports. The Orbitz for Business portal provides users with an easy-to-use, familiar experience that is consistent across all booking channels including online, tablet and mobile, plus access to corporate travel agents to assist with bookings and in-trip support. For more information on Visa Travel Solutions, visit visa.com/commercial. Orbitz for Business is the corporate travel brand of Orbitz Worldwide (NYSE: OWW). Launched in 2002, Orbitz for Business offers a complete portfolio of global business travel products and services that help corporate customers plan, search and book travel. Orbitz for Business leverages Orbitz Worldwide technology, customized for corporate travelers. In addition to its technology, Orbitz for Business delivers full service, cost effective travel management solutions including 24/7 customer support; expense reporting and policy management tools; and comprehensive choice in travel inventory.